Can the State Department Recover from WikiLeaks? How big a mess has been caused by the release of the WikiLeaks documents? It may depend on who you ask. A senior Foreign Service officer at the State Department said he was "disgusted, totally disgusted" by the massive release of 250,000 diplomatic cables. This is what he and his colleagues do. They report from the field back to Washington on political, economic and other developments in the countries to which they are assigned. Others say the information is not too surprising and really not all that troublesome. When Secretary of State Hillary Clinton was making calls to her fellow foreign ministers to do some damage control, she saidone told her "Well, don't worry about it. You should see what we say about you." That was about the only touch of humor there was as official Washington grappled with what is clearly more than your ordinary PR problem. The Obama administration's reactionhas so far been predictable. The White House has ordered government agencies to examine the way they treat classified information. The Attorney General, Eric Holder, said the release of the documents "puts at risk our national security" and announced "an active, ongoing criminal investigation." A senior State Department official said, "We have taken steps to mitigate and ensure this does not happen again." A 24/7 working group has been established to monitor next steps and reaction. It all sounds like too little, too late. The issue is the damage which has already been done, and notwithstanding all the remedial steps which Washington takes the harm will be long-lasting and impossible to paper over. Blame the internet and the ability of a misguided individual to manipulate the system by easily downloading a quarter of a million documents. (Still not explained is how that action did not trigger some sort of alarm.) Blame the post-9/11 atmosphere which encouraged more sharing of information across various government agencies. Blame WikiLeaks for being irresponsible. Jimmy Carter: WikiLeaks "Helps No One, But Hurts Diplomatically"
Actually, it does not matter who or what is to blame. Nothing that is said in Washington is going to be taken seriously, at least not by a foreign leader or government already made to look silly or worse because a supposedly private diplomatic cable now has been splashed across the internet and the front pages. While some of revelations are surprising, it is not as if most of what has been made public by WikiLeaks was all that shocking. Still, no one likes to see their private thoughts made public. The publication of these diplomatic cables will cause no end of embarrassment for American diplomats and the political leaders who set the policies they follow. After the cables reported Russia's President Medvedev as "afraid, hesitant," Germany's Chancellor Merkel as "rarely creative," France's President Sarkozy as a "naked emperor," and Italy's Prime Minister Berlusconi as "feckless" Secretary Clinton was compelled to offer a formal apology: "...the United States deeply regrets the disclosure of any information that was intended to be confidential, including private discussions between counterparts or our diplomats' personal assessments and observations." The disclosures are certain to cause foreign officials to be less forthcoming in their exchanges with American diplomats. The same will doubtlessly hold true for human rights activists who already have justifiable fears about telling American diplomats about abuses in their countries. Another casualty is likely to be that future cables from American diplomatic posts abroad will contain less candid information about the foreign leaders they are reporting on. Now everyone can see at least some of what American diplomats do on a day to day basis, something Clinton sees as one of the few good things to come out of this story. "There have been examples in history in which official conduct has been made public in the name of exposing wrongdoings or misdeeds. 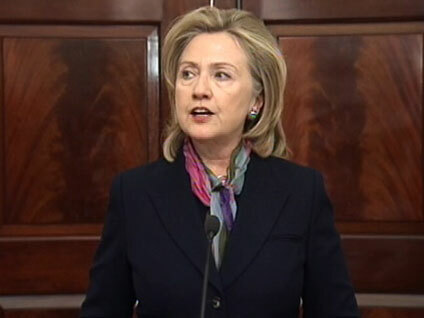 This is not one of those cases," Clinton told reporters at the State Department. "In contrast, what is being put on display in this cache of documents is the fact that American diplomats are doing the work we expect them to do." The workload for American diplomats just got a lot harder, most of all for diplomat-in-chief Hillary Clinton, who left Washington after the WikiLeaks disclosures to travel to Central Asia and the Middle East. After having to meet face to face with one foreign leader after another over the next week, it may be a relief just to get back to Middle East peacemaking and dealing with Iran's nuclear ambitions. Charles Wolfson is CBS News' State Department Reporter. You can read more of his posts in Hotsheeet here.